“You should keep in mind that Gazan employees have not received their salaries in full for eight months and have, thus, been unable to earn a living for their households and children,” al-Haya added. “We’ve always showed an undeniable support for the reconciliation process. No backward moves are allowed at this stage. The rift is over and we should all be working towards unity and real partnership so as to liberate our soil, people, and sanctities,” Hamas statement pointed out. “Haven’t we agreed that the unity government is the government of all people, Gazans and West Bankers alike?” Hamas leadership inquires. 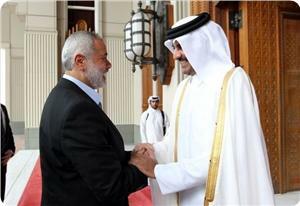 Hamas further hailed the Arab countries that have been backing up the reconciliation process, most notably Qatar for having provided a security net throughout the crisis. In a related event, the Palestinian Trade Union in Gaza warned of a potential escalation in its protest-moves due to the government’s lack of commitment towards the rights of Gazan workers. Chairman of the Union, Muhamad Siyam, held Abbas and Rami Hamdallah responsible for the state of anxiety triggered lately. The protestors urged the Palestinian Legislative Council (PLC) to make every possible effort to solve Gaza’s salary crisis. Along the same context, PLC Deputy Yahya al-Abadsa slammed Abbas’s statements over the Palestinian unity government and its projected duties. “Hamas firmly rejects any potential proclamations that the unity government might tolerate the acknowledgment of Israel’s right to exist and abide by the Quartet’s conditions. We will always make sure to uphold our national basics,” the PLC deputy maintained. “True, the rift is over, once and for all. But we still have, as a national faction, the right to object to any potential violations to be committed by the government. 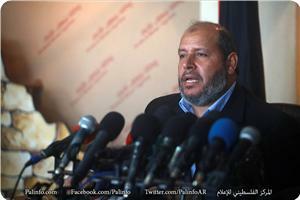 We shall never ever abide by the Israeli and American prerequisites,” Hamas member concluded. 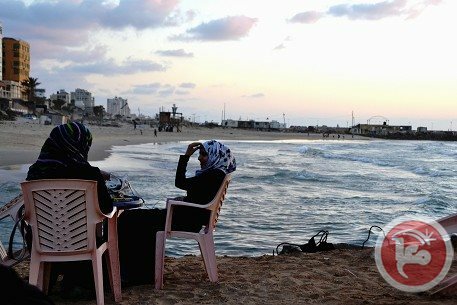 An economic conference is slated to be held in the Gaza Strip in November, one of the conference's organizers said Friday. Palestinian businessman Munib al-Masri told Ma'an that the main goal of the conference would be to encourage entrepreneurs from Palestine and other Arab countries to invest in projects in the Gaza Strip. The conference's conveners will seek to develop electricity, water, and telecommunications networks in Gaza, al-Masri said. "We want to implement the will of the late Palestinian president Yasser Arafat, who wanted Gaza to be the Singapore of the Mediterranean," he told Ma'an. The Hamas movement said that Qatari Emir Sheikh Tamim bin Hamad Al Thani pledged to help the newly formed Palestinian national unity government pay the salaries of its employees in the Gaza Strip. In a brief statement, Hamas asserted that the deputy head of Hamas's political bureau Ismail Haneyya, phoned the Qatari Emir and urged him to support the new Palestinian unity government and help it fulfill its financial obligations. 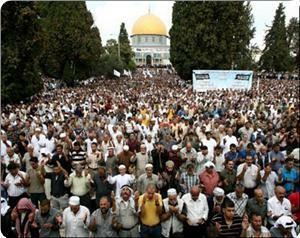 For his part, Sheikh Tamim agreed to fund Gaza civil servants' salaries, the movement said. The Palestinian unity government has paid only the salaries of Gazan civil servants who worked for the former Palestinian Authority government in Ramallah city which raised the ire of those hired by the previous Hamas-affiliated government in the Gaza Strip. Consequently, several former Hamas-affiliated government civil servants on Thursday morning prevented their counterparts from Fatah from receiving their salaries through ATM machines located outside Gaza banks. Furthermore, Haneyya congratulated over the phone Prime Minister Rami Al-Hamdallah on his new responsibilities and briefed him on his phone conversation with Qatar's Emir. The European Union granted the Palestinian Authority €15.5 Million for salaries and pensions for the months of May, to be transferred to more than 70.000 government employees, and pensioners, and for other basic expenses. EU Representative John Gatt-Rutter stated that the money would be paid through the European PEGASE mechanism, meant for channeling EU assistance to the Palestinian Authority, and for implementing its development and reform projects in the occupied territories. The official said this latest contribution is meant for salaries and pensions, and that it is part of ongoing assistance by the European Union to the Palestinian people. 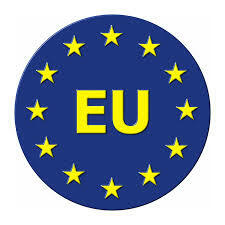 It is worth mentioning that, despite Israeli complaints against the Palestinian Authority for forming an interim unity government and the reconciliation between Fateh and Hamas parties, the EU welcomed the new government and said that it would support it as long as it abides by previously signed agreements, adding that the interim government does not have any Hamas minister. Gatt-Rutter stated that the new government faces various challenges, especially since it is acting on providing basic services to the Palestinians in the West Bank, and the Gaza Strip. He added that the EU intends to continue to provide support to the Palestinian Authority, to ensure it is capable of performing its duties. The United States and the EU said the relationship with the new Palestinian government is based on its adherence to the policies and commitments recognized by the Quartet Committee. PEGASE is now also the main instrument used by the EU to channel financial assistance directly from the European Union budget and from EU Member States to support recurrent costs under the Palestinian Authority's own budget. The Palestinian unity government's decision to pay only the salaries of Gazan civil servants who worked for the former Palestinian Authority government in Ramallah city raised the ire of those hired by the previous Hamas-affiliated government in the Gaza Strip. 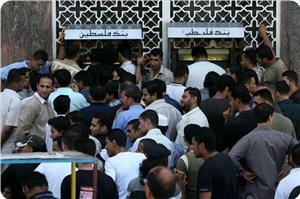 Consequently, several former Hamas-affiliated government civil servants on Thursday morning prevented their counterparts from Fatah from receiving their salaries through ATM machines located outside Gaza banks. Fistfights broke out between Hamas and Fatah employees near the cash machines and Palestinian riot police intervened to break up the scuffles. Furthermore, all banks were shut down after employees from Hamas rallied outside them. The angry Hamas government employees stated in press remarks that the unity government is responsible now for their payroll and demanded it to pay their salaries without discrimination. In this regard, member of Hamas's political bureau Mousa Abu Marzouk warned the Ramallah-based unity government of discriminating between employees according to their political affiliation. Abu Marzouk stated on his Facebook page on Thursday morning that the current Palestinian government is a national consensus government and not a successor to either of the previous governments in Gaza or Ramallah. "The consensus government must not consider itself a continuation of the [former] Ramallah government. The government's actions want to entrench the idea that we are two teams and that there are legitimate people and others who are not. It wants to sow the seeds of discord again and bring back the division which we had left behind our backs," the Hamas official said. He reiterated that the unity government is tasked with achieving social reconciliation and should not discriminate between the Palestinians and make them fight each other. 33% of Palestinian households had been subject to food insecurity over the course of 2013, a statement issued by the Palestinian Central Bureau of Statistics and the UN World Food Program revealed on Monday. The percentage in the Gaza Strip has been thrice as much as that recorded in the West Bank, the report documented. The survey further reported a rise in the percentage of food insecurity from 27% in 2012 to 33% in 2013 due to the swift upsurge in unemployment rates, the instability of the socio-political scene, and the rise in food prices and the standards of living. The unemployment percentage in Palestine has gone up to 29.3% in 2013 due to the Israeli constraints imposed on movement, besides the escalating breakdowns rocking the Palestinian economy. “Despite the sufficient amounts of food items in Palestinian markets, the prices are unbelievably high, generating a remarkable shortage in basic nutrients and leading to malnourishment among Palestinian families,” the statement further reported. Economy experts held the Paris Convention, which charged Palestinian goods a tax rate of 16% to be shelled out to the Israeli occupation authorities, responsible for such setbacks. The Palestinian economy has been made quite impingent on the Israelis. Whenever Netanyahu’s government rules for lifting the tax-rate, Palestinians’ would automatically have to opt for the same. 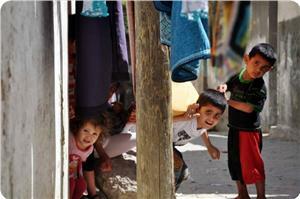 The low monthly incomes among Palestinians have made the situation even worse. Though the minimum wage has been set down to 1450 shekels (around 410 US. dollars), more than 110 thousand workers and employees in the West Bank and the Gaza Strip have not benefitted from that law, the Statistics Bureau further asserted. Sam Bahour is a Palestinian-American business consultant in Ramallah and serves as a board member and executive committee member at a leading Palestinian bank. Palestinians living under Israeli military occupation in the West Bank, East Jerusalem, and Gaza Strip use the Israeli currency, the New Israeli Shekel, for their daily business. However, as the peace negotiation efforts of Secretary John Kerry stumbled (many would say failed) in late April, Israel took many punitive measures to punish Palestinians for not accepting full political submission. One such measure is that Israel informed the Palestinian side that it would no longer allow Palestinian banks to transport their surplus Israeli currency to the Israeli Central Bank, an act that is unheard of in the world of banking. Israel is refusing to serve its own currency. In effect, Israel is declaring war on the Palestinian economy, risking the collapse of the thriving Palestinian banking sector, and disrupting the flow of basic goods such as electricity, petroleum, and natural gas into Palestine. The Palestinian economy in the West Bank and Gaza Strip was purposely made structurally dependent on Israel ever since the Israel military occupied the area in 1967. This Israeli-crafted structural dependency took many shapes and forms, starting with Israel creating a captive Palestinian consumer base for its products and services by militarily controlling all the borders between the occupied territory and the outside world, all the way to installing the Israeli currency, the Israeli shekel, as the daily currency among Palestinians. Before the Oslo Peace Accords, within the accords itself, and all the way through today, this forced dependency has been maintained. The Israeli currency enters Palestine from multiple sources, primary among them being the salaries received from Palestinian workers who receive Israeli military permits to seek employment in Israel. There are 47,350 Palestinian workers who enter Israel legally (quota as of March 2014) with an estimated additional 15,000-20,000 who enter illegally without permits. Prior to the era of the Oslo peace process, which introduced a physical separation barrier between the two economies, the total number of Palestinian workers from the West Bank and Gaza Strip who used to work in Israel reached 120,000. These workers are paid in New Israeli Shekels and usually return home to the occupied territory every night where they spend their money in the Palestinian economy. 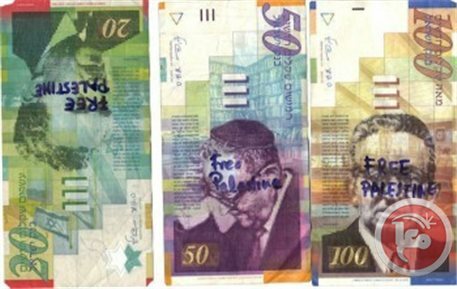 When Palestinians purchase the goods and services they consume, such as electricity, petroleum, natural gas, foodstuffs, medical care at Israeli hospitals, etc., they are required to pay Israeli suppliers in their home currency, the New Israeli Shekel. These payments are made on behalf of Palestinian clients from the Palestinian banking system to Israeli suppliers via the Israeli banking system. For example, the Palestinian Authority consumes 70-80 million NIS every month from the Israeli electric company for the electricity that is purchased for the occupied territory, including Gaza; 500-600 million NIS is purchased from the Israeli petroleum refineries every month to cover all the petroleum products consumed; and 25 million NIS is paid monthly to Israeli health care providers. As can be seen, the magnitude of these purchases is enormous given the $6 billion Palestinian economy purchases over 85 percent of its goods and services from Israel. When Palestinian banks make an electronic transfer to Israeli banks they must back up such a transfer with actual cash, New Israeli Shekels. It is common practice in the world of banking that countries respect their own currency. Actually, not only is it common practice that a country respect its own currency but the norm is for it to actually pay what is called seignorage to other countries who adopt their currency to compensate for the profits the home country makes from others using their currency, thus increasing its value. Israel has always refused to pay seignorage to Palestinians and now has gone one step further and has declared that Palestinians cannot physically transfer their surplus Israeli currency to the Israeli Central Bank. The expected results of this punitive measure are many. First, given the Palestinian bank safes are now overflowing with their clients' shekels, the banks will need to stop accepting deposits. Secondly, as Palestinian businesses will not be able to make electronic transfers, they will be forced to move large sums of cash directly to their Israeli suppliers. Given that most Palestinians do not have access to cross the illegal Israeli separation wall, they will need to look for intermediaries to transfer the cash to their Israeli suppliers, causing not only the creation of a black market, but a dangerous security situation. The equivalent of a central bank in the Palestinian Authority is the Palestine Monetary Authority and they are not accepting this Israeli administrative punishment sitting down. The PMA Governor, Dr. Jihad Al-Wazir, has made it public that he is looking to use this regrettable situation to further advance structural changes in the Palestinian monetary system. One such immediate change is the possibility to "dollarize" the Palestinian economy and stop using Israeli currency altogether. Another possibility is the issuing of an independent Palestinian currency, which is a much larger project that has been in the works for quite some time and may be accelerated in response to these latest Israeli measures. 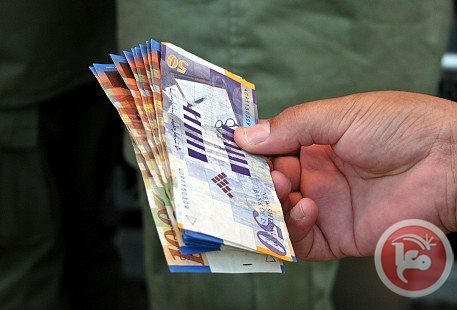 In the meantime, the Israeli "Civil" Administration (the branch of the Israeli Ministry of Defense, which is responsible for managing the occupied territory) is negotiating with Palestinian authorities and bankers to restart, incrementally, the flow of shekels to the Israeli Central Bank. Sadly, Palestinians are all too familiar with having to negotiate these administrative issues just in order to survive. It is not a secret that Israel and Israeli banks have used Israel's occupation to not only reap huge financial benefits, but also to allow Israeli banks to further advance the occupation itself. The Coalition of Women for Peace, an Israeli organization of women activists which created the Who Profits from the Occupation website, has addressed this Israeli banking complicity with the occupation in their report, Financing the Israeli Occupation (October 2010). Since this report was issued many things have changed, mainly, the Palestinian side has since been recognized as a member state in the United Nations, which places at its disposal many more diplomatic tools to hold Israelis directly accountable for its illegal practices. Many believe that the Israeli military occupation is comprised only of tangible items, like settlements, walls, checkpoints, warplanes and the like, whereas the reality is that the weight of the occupation is actually comprised of myriad administrative rules and restrictions. These administrative elements of the occupation are ones that cannot be photographed, things like a permit system, which dictates Palestinian movement and access; control of Palestine's electromagnetic spectrum, which deprives Palestinians of 3G mobile services; prohibitions on the ability to dig wells, which limits not only our ability to build a proper agricultural sector, but deprives many of us of drinking water; and, of course, military dictates that have the power to collapse an entire banking sector. The international community is starting to wake up to the three-dimensional reality of the Israeli military occupation. For those who prefer to remain in their deep slumber, Palestinians, acting in their capacity as a state, will be reminding them of their obligations under international law to not allow Israel to continue to act in the rogue fashion that has become commonplace. Israel's ongoing actions are jeopardizing any possibility for a negotiated settlement between Palestinians and Israelis. A sustainable fiscal position and strong public financial management systems are key elements for building the institutions of a future Palestinian state. 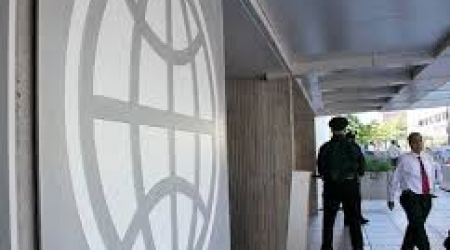 The World Bank Board of Executive Directors approved today a US$40 million grant to support the Palestinian Authority’s (PA) strategic reform priorities. The Development Policy Grant (DPG) which aims at improving the PA’s fiscal position, building robust public financial management systems and improving access to finances for Palestinian enterprises will contribute to building the institutions of a future Palestinian state. With the current stalemate in the peace process and the decline of economic growth and donor aid, the grant will help ease some of the PA’s fiscal stress. This Grant, the sixth in a series, totaling US$240 million in budget support, is supplemented by approximately an additional US$200 million in donor support every year to advance the Palestinian Authority’s reform agenda. The PA continues to focus efforts on providing efficient and transparent public services, enhancing capacity of local governments, security and justice systems, and strengthening citizen participation in decision making. The World Bank will continue to collaborate with other donors, especially through the multi-donor trust fund that is administered by the Bank on key issues that are critical for economic and social development.